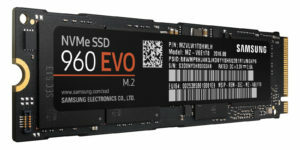 The use of M.2 SSDs has recently become more and more attractive, because nowadays an M.2 connection is often already installed on the mainboards. Although M.2 SSDs are barely larger than a chewing gum strip, they are in no way inferior to their larger siblings, the 2.5-inch SSDs. On the contrary, M.2 SSDs are up to five times faster than regular SATA SSDs. This is because the SATA 3 standard provides for a maximum transfer rate of 6 Gbps. M.2 (PCIe 3.0 x4) enables connection via up to four PCI Express 3.0 lanes, however, providing a bandwidth of up to 32 Gbps. Samsung’s M.2 SSD is at the forefront in terms of speed. The current Samsung 960 EVO and 960 Pro have quite similar performance values for reading and writing. The big difference, however, lies in the price of the M.2 SSDs. Therefore, the legitimate question arises: How does this price difference come about and which M.2 SSD should I buy? I have therefore subjected the currently available Samsung modules to a comparative test. A main reason for the price difference is the type of memory used and the associated service life. NAND flash memory is divided into MLC (Multi-Level Cell) and TLC (Triple-Level Cell). The TLC memory can store 3 bits per cell, which makes it cheaper compared to MLC memory (with only 2 bits per cell), but at the same time it is generally slower and the flash cells wear out somewhat more. M.2 describes only the type of connection, but not the electronic transmission. M.2 can thus provide both SATA and PCI Express as interfaces, depending on the “coding” of the plug-in card. As a result, M.2 SSDs are not necessarily faster than traditional 2.5-inch SSDs with SATA interfaces. 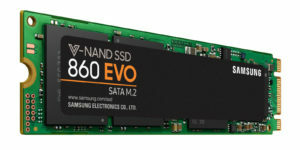 In fact, many commercially available M.2 SSDs are connected to SATA 3 instead of PCIe, including the 860 EVO. They are therefore subject to the same speed limits and offer no speed advantage. With M.2 ports, which in turn are connected via PCI Express, data rates of up to 4GB/s are possible in combination with the new NVMe protocol – more than 7 times higher than SATA and AHCI. The Samsung 860 EVO uses V-NAND TLC memory cells with 64 layers. This 3-bit triple-level cell flash (TLC) is generally slightly slower than 2-bit MLC memory. Wear is also slightly higher compared to MLC flash cells. However, the VNAND version of the TLC flash cells largely compensates for these disadvantages in terms of service life and robustness. To compensate for the performance disadvantages of the TLC memory, Samsung uses an SLC buffer memory, the so-called TurboWrite, for the 860 EVO. However, if this SLC cahe is full, a significant performance slump is noticeable. This reduces the write rate to a measly 300 MByte per second, especially for the smaller models (250GB + 500GB). In everyday private life, however, the cache seldom reaches its performance limits. The 860 Evo runs with the AHCI protocol via the SATA interface. This limits performance and puts it far behind NVMe SSDs with PCIe, such as the Samsung 960 PRO / EVO. No matter how fast the storage is, no more than about 550MB/s are effectively possible via SATA. The guaranteed writing performance depends on capacity and on the smaller models is 150 TB Written and rises up to a remarkable 1200TB Written, with a guarantee period of 5 years. In the home user area, the 860 EVO M.2 thus survives the service life of most PCs. The 960 Evo is only available in M.2 form factor. Capacities of 250GB, 500GB or 1TB are available. The Evo uses PCIe 3.0 with four lines (PCIe 3.0 x4) and works with the NVMe protocol. Compared to the more expensive 960 Pro, however, around 8% performance has to be dispensed with, because the difference lies in the memory: instead of higher-quality MLC flash memory, the 960 EVO uses the more favorable TLC variant of the current V-NAND. This Triple-Level-Cell-Flash (TLC) can store 3 bits per cell, which makes it cheaper compared to MLC memory, but at the same time it is basically slower and the wear is slightly higher. To minimize the performance disadvantages of the TLC memory cells, Samsung uses an SLC buffer memory (TurboWrite Cache) for the EVO, which significantly accelerates the speeds. However, if this cache is full, this puts a lot of pressure on performance. With the controller, the 960 EVO and Pro are again identical and rely on the new 5-core Polaris controller. For even greater reliability, the integrated Dynamic Thermal Guard (DTG) function monitors and adjusts the temperature of the SSD. A sticker on the underside of the module has a thin layer of copper that serves as an additional cooling element. The guaranteed writing power depends on the capacity and is between 100 – 400TB written. This only half as high writing performance, in direct comparison to the 960 Pro, is due to the TLC flash memory. However, this sounds more dramatic than it is. The 960 EVO survives in practice the period of use of almost every PC or notebook. The manufacturer’s warranty from Samsung is 3 years. As is usual with SSDs, the warranty is not only limited in time, but also in writing performance (TBW). The warranty expires, whichever comes first. The Samsung 960 EVO requires an M.2 connector with PCIe 3.0 x4. Only current platforms offer this speed, while SATA 6 Gb/s is widely used. The remedy is a M.2 to PCIe adapter card, which must be purchased separately. 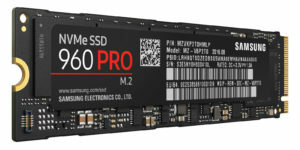 Samsung’s flagship M.2 SSD is the 960 Pro in memory sizes from 500GB – 2TB. The Pro version of the 960 is also only available in M.2 form factor and differs from the EVO primarily in its higher quality flash memory and durability. This also explains the price difference between EVO and Pro. The three-dimensional VNAND MLC flash memory is layered in 48 layers and is controlled by Samsung’s 5-core Polaris controller. This achieves exorbitant read and write rates compared to SATA. And the 960 Pro with its MLC memory does not require pseudo-SLC. The integrated DTG function monitors and adjusts the temperature of the SSD for even greater reliability. As on the 960 EVO, a sticker with a thin layer of copper is also attached to the underside of the 960 Pro. This serves as a cooling element and reliably lowers the temperature. The warranty on the 960 Pro is limited to 5 years and the guaranteed writing performance (TBW). The warranty expires, whichever comes first. For the Samsung 960 Pro, the guaranteed writing performance, depending on the capacity of the size, is a remarkable 400TB Written (500GB model) to 1200TB Written (2TB model). This means that the point of criticism regarding service life, which is still often appropriate in some cases, is finally history. The Samsung 960 Pro requires an M.2 connector with PCIe 3.0 x4. Only current platforms offer this speed, while SATA 6 Gb/s is widely used. The remedy is a M.2 to PCIe adapter card, which must be purchased separately.